Scientists have found signs of life on one of the world's newest islands, just four years after it was spawned by a volcanic eruption. Unofficially known as Hunga Tonga-Hunga Ha'apai, it lies in the kingdom of Tonga, and is already nurturing pink flowering plants, sooty tern birds, and even barn owls. 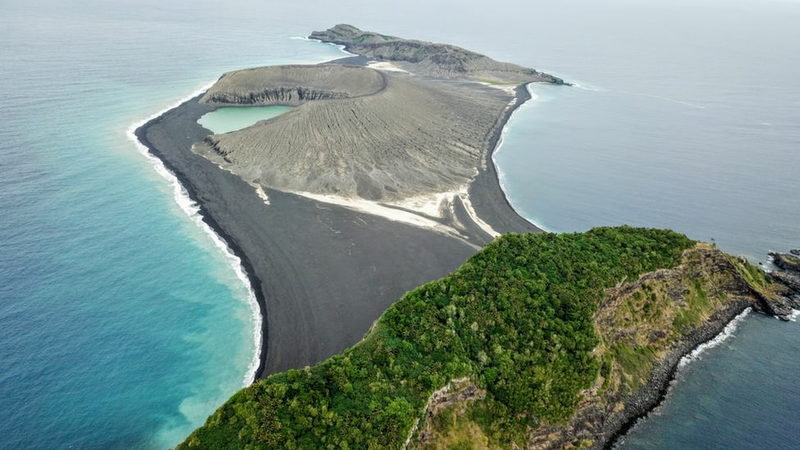 Hunga Tonga-Hunga Ha'apai - named after the two islands it is nestled between - was born in December 2014 after a submarine volcano erupted, sending a stream of steam, ash and rock into the air. When the ash finally settled, it interacted with the seawater and solidified. A month later, the new island was formed. It isn't uncommon for underwater volcanic eruptions to form little islands, but they usually have shorter life-spans. Hunga Tonga-Hunga Ha'apai is one of just three to emerge in the last 150 years that have lasted more than a few months. "In this case, the ash seemed to have a chemical reaction with the seawater that allowed it to solidify more than it usually would," volcanologist Jess Phoenix told the BBC. She compares the island to Surtsey, an island in Iceland that was formed in a similar way in the 1960s, and is still around today. Nasa had predicted in 2017 that the island could last between six and 30 years. But Mr Slayback was not as optimistic after visiting, saying the island was eroding faster than predicted. Edit: The new island is the crater in the center of the photo, not the forested area in the foreground. But does it have oil? I assume that's a joke!? Oil is found in old sedimentary basins, with the remains of marine organisms. Neither of these criteria are likely in volcanoes. Wonder if it's open for tourists. D'fuk the owls are eating?